Weekly Standard: McConnell Speaks For 'He' Not 'We' After Senate leader Mitch McConnell's debt plan appears to essentially submit to Democrats, some feel they have it in the bag. However, as Stephen F. Hayes of The Weekly Standard contends, McConnell doesn't speak for the majority of the GOP. Republican Senator Orrin Hatch, Utah, looks on as Senate Minority Leader Mitch McConnell speaks to reporters on Capitol Hill about balancing the budget. Stephen F. Hayes is a senior writer at The Weekly Standard. Shortly after Senate minority leader Mitch McConnell unveiled his "contingency" plan for a debt limit increase, the Associated Press bulletin read: "GOP Leader McConnell proposes giving Obama new power for automatic debt limit increase." It's surely not the headline McConnell wanted, but unlike much of the media coverage of the debt fight, it's accurate. And that's a problem. It is not, however, the main problem with the McConnell plan. Far worse, in my view, is that the plan isolates House Republicans, it undercuts their (tentative) plan to offer an aggressive debt limit proposal of their own, it turns their principled intransigence from a possible strength to a certain liability, and it virtually ensures that, in the event of default, Republicans — not the White House — will be blamed. Read Another Opinion On McConnell And The Debt Talks. McConnell's plan gives the president the ability to raise the debt ceiling through 2012, in three separate increments, by requiring Obama to propose spending cuts greater than each request. Its main virtue is that these hikes would have to pass largely with Democratic support — something that McConnell and others believe will redound to Republicans' benefit heading into the 2012 election cycle. And, the theory goes, if President Obama offers phony spending cuts, as he almost certain to do, his posturing as the "adult in the room" on entitlements and spending will be exposed as unserious. But there's the catch, too: the spending cuts do not have to be real or even implemented in order for the president to get his debt ceiling increases. McConnell acknowledged this at the press conference to announce the plan Tuesday afternoon. ABC's Jonathan Karl asked: "Does it guarantee you'll get your spending cuts or not?" McConnell responded: "No, it doesn't." That fact means the McConnell plan will be nearly impossible to get through the House of Representatives. "There is zero chances it'll pass the House," said one House leadership aide. "Zero. I'm not sure it would get any votes from our side." A second leadership aide agreed. "It won't pass." If that's true, and there are many reasons to believe that it is, the McConnell proposal sets up House Republicans — and only the House Republicans — to be the villains. Here's why. In the negotiations pre-McConnell plan, Republicans in both houses were united on the three big things: major spending cuts, entitlement reforms, and no new taxes. The fact that House Republicans had been elected to cut spending and reduce the size of government was an advantage. The White House had to understand that any proposal with new taxes or too few spending cuts stood the chance of being rejected by the House. And while the White House had the upper hand in messaging on blame — in part because of the threat of withholding Social Security checks, etc., and in part because of a sycophantic media — there was at least the possibility that the White House would have owned some of the failure to reach a compromise. The chances the White House would have been blamed could well have increased if House Republicans had decided to move forward with their own aggressive proposal — in effect, daring Harry Reid and President Obama to choose to reject it. While this option was discussed at length, there were two main concerns: 1) an aggressive and specific plan puts Republicans once again on the record voting for things that can be easily demagogued by Democrats; and, 2) the opposition to voting to increase the debt limit in the House is strong enough that coming up with a plan that would pass the House and tempt Democrats would have been difficult, if not impossible. Had House Republicans been able to craft such a plan they would have forced a choice on Senate Democrats and the White House: austerity or default. In such a scenario, President Obama, having warned repeatedly about the catastrophic consequences of default, would have had to defend that choice if he refused to accept the House GOP plan. A high-risk strategy, to be sure, but one with at least the possibility of succeeding. Now, the White House has a third option: the McConnell plan. Or, as it's sure to be known soon, "the bipartisan McConnell plan." Why would the White House, which originally pushed for a clean debt limit vote, however unrealistic that might have been, agree to real entitlement reform when there is an alternative that allows them to raise the debt ceiling without doing so? Democrats have made clear their willingness to misrepresent Republican plans to reform Medicare, Medicaid, and Social Security and their plans to campaign on those mischaracterizations for the next 17 months. And with various Democratic leaders having tried to take entitlements off the table — Chuck Schumer, Harry Reid, Nancy Pelosi — what are the chances they'll make those hard choices without the threat of severe economic disruption? Slim. Not surprisingly, the proposal has received a warm reception from Democratic leaders. Harry Reid said Tuesday that he was open to considering it. White House spokesman Jay Carney said that the McConnell proposal means "defaulting on America's past due bills is not an option." And two sources familiar with the discussions at the White House Tuesday afternoon said that Nancy Pelosi offered McConnell "congratulations." Republicans are divided. A source close to Senator Jim DeMint tells TWS that he is "opposed" to the McConnell plan. Orrin Hatch tweeted that the only plan he supports is "Cut, Cap and Balance." Senator Ron Johnson declined to endorse the McConnell plan and offered a similar statement. "I will continue to focus on getting the Cut, Cap and Balance legislation passed — which does increase the debt ceiling but only contingent upon us actually fixing the problem." 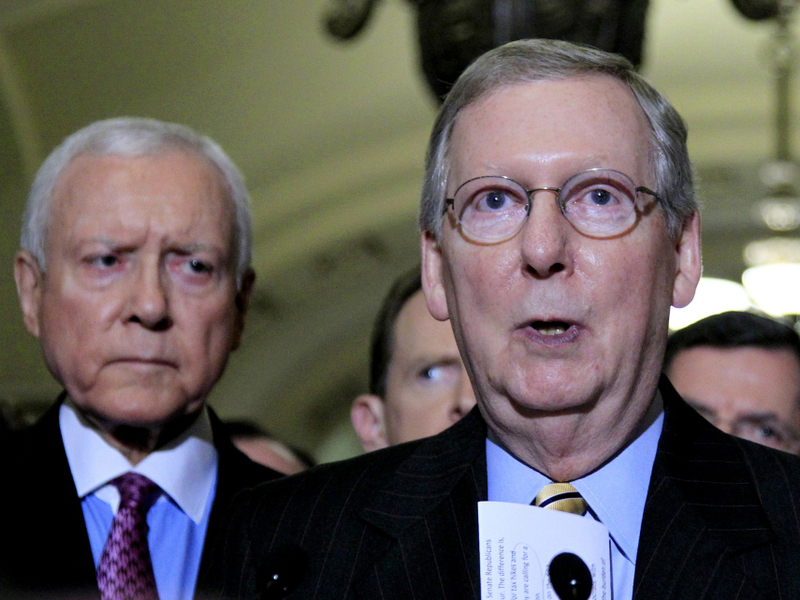 Sources close to two other senators tell TWS their bosses oppose the plan. As one might expect, the House Republican reaction to the McConnell plan was almost uniformly negative. "The rank-and-file were ripping him today," says one House Republican. Although Boehner told Fox News Channel's Bret Baier that he did not feel undercut by the McConnell proposal, other sources suggest he does. One Republican source tells TWS that House leadership "made it clear that it would be tough sledding in the House and among conservatives, but he wanted to float it anyway." Asked repeatedly about the McConnell plan, House majority leader Eric Cantor praised the Senate leader and his resolve but noted that it was clear it had little to no chance to passing the House. McConnell's proposal ensures that Senate Republicans would not be blamed for any of the economic disruptions that would accompany a default — or those caused by the White House in advance of a default. But it also virtually ensures that House Republicans would be. McConnell seemed to understand this at his press conference Tuesday. A reporter asked: "Why would you agree, why would Republicans in the House agree to essentially raising the debt ceiling without getting spending cuts?" He responded: "What we're not going to be a party to — in the Senate, I'm pretty confident — is default." The "we" in his response does not mean "Republicans," but "in the Senate." But what if, somehow, the McConnell plan does get through the House? Would that be the end of the world? Not really. It would mean Republicans passed on an opportunity to reduce the debt down to $24 trillion by 2020 instead of $26 trillion (or, theoretically, $22 trillion with tax hikes). That's not much of a difference if you don't actually reform the programs and put them on a path to sustainability. If we drown in debt, it doesn't much matter whether the lake is 24 feet or 26 feet deep. On the other hand, it seems early to cave. As one Republican skeptical of the McConnell plan put it: "If we give up three weeks early just because the president said 'Social Security checks,' (which we all knew was coming six months ago), why did voters elect us in the first place? New GOP slogan: 'Fighting for limited government is too hard, but if you keep electing us, we'll keep promising to really, truly, finally fight for limited government when we control all three branches with big majorities.'" "Oh wait, that was the old slogan."